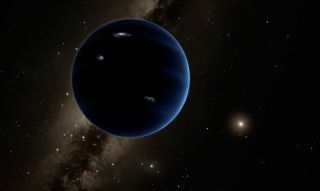 Artist’s concept of “Planet Nine,” a hypothesized world about 10 times more massive than Earth that may orbit far from the sun. Astronomers have found evidence of a big, undiscovered "Planet Nine" far beyond Pluto, and a SpaceX rocket nearly landed soflty on a ship at sea after a successful satellite launch. Here are Space.com's top stories of the week. A massive planet beyond Pluto? Are all the aliens extinct? First flowers grown in space? Happy 10-year anniversary, New Horizons! When will humanity make contact with advanced aliens? Do 'space noodles' swirl in the Milky Way?